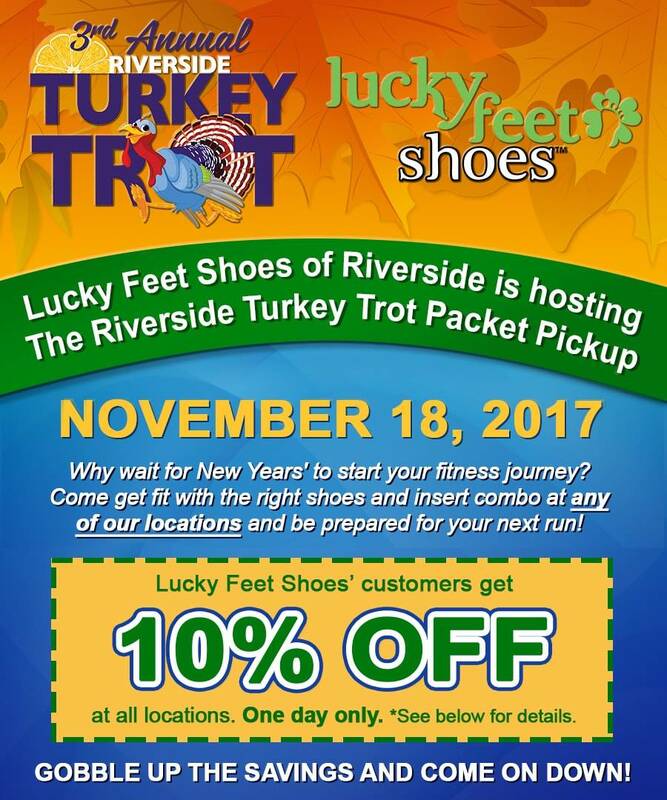 Lucky Feet Shoes of Riverside is hosting The Riverside Turkey Trot Packet Pickup this Saturday, November 18, 2017, at the Riverside location. Lucky Feet Shoes’ customers get 10% OFF at all store locations. This is an ONE DAY ONLY special so don’t miss out. Plus, Lucky Feet Shoes’ customers save $5 during online registration. Register at RiversideTurkeyTrot.com and enter code: LUCKY. Why wait for New Years’ to start your fitness journey? Come get fit with the right shoes and insert combo at any of our locations and be prepared for your next run! See you this Saturday! The Riverside Turkey Trot is a 5K, 15K and Mini-Trot Kids Race on Thanksgiving morning. See RiversideTurkeyTrot.com for details.